Researchers evaluated bicycle and motor vehicle interactions at nine locations in Duluth, Mankato, Minneapolis and St. Paul,in a study sponsored by the Minnesota Local Road Research Board to better understand how bicycle facilities affect traffic. Results show that on shared roadways without clearly marked bicycle facilities, drivers are more inclined to pass bicyclists, encroach on other traffic lanes or line up behind bicyclists than on roadways with clearly striped or buffered facilities. “This project gave us qualitative information and some quantitative information. The observations made provide something we can build on,” said James Rosenow, Design Flexibility Engineer, MnDOT Office of Project Management & Technical Support. “The solid line makes the absolute difference in bicycle facilities— something that we haven’t seen in any other study. We found that the presence of a clearly marked or buffered bicycle lane makes a large difference in the way drivers behave around bicyclists,” said John Hourdos, Director, Minnesota Traffic Observatory, University of Minnesota. Planners and engineers typically consider bicycle facilities from the bicyclist’s perspective. It is less common to design and plan for bicycle use from the driver’s perspective. However, effective multimodal planning requires an understanding of how bicycles affect traffic if congestion-causing interactions are to be avoided, particularly on high-volume roads. Bicycle facilities must invite use, ensure safety for all road users and at the same time not slow traffic. This project aimed to investigate interactions between drivers and bicyclists on urban roadways that employ various bicycle facility designs, and to determine how different bicycle facilities affect traffic. Researchers sought to look at bicycle facilities from the driver’s point of view. Sharrows can be marked with or without stripes. By themselves, sharrows seem to have no more impact on traffic than do no bicycle facilities at all. The investigation team reviewed 44 bicycle facility design manuals and guidance documents, 31 research papers on implementation or assessment of facility designs, and design manuals used by seven other Complete Streets programs from around the United States to identify facility designs that warranted further study. 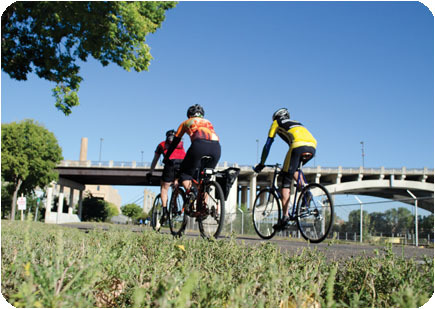 With help from the MnDOT Technical Advisory Panel and local planners, the team selected nine sites in Duluth, Mankato, Minneapolis and St. Paul that offered a range of facilities—buffered bicycle lanes, striped bicycle lanes, sharrows (shared-use arrows), signed shared lanes and shoulders of various widths. At each site, they set up one to three cameras and videotaped during daylight hours for five to 51 days. Researchers then trimmed the video data into relevant car-and-bicycle-interaction time frames. This yielded from 16 to 307 hours of video from each site for detailed analysis. The research team then reviewed the video and analyzed how drivers behaved when encountering bicyclists on roads with and without bicycling facilities. Researchers grouped driver behavior into five categories: no change in trajectory, deviation within lane, encroachment on adjacent lane, completion of full passing maneuver and queuing behind bicyclists. Researchers confirmed their observations with statistical modeling. After analyzing the results of behavior as it correlated with facility type, researchers presented the traffic flow implications of different bicycle facility designs. Literature Review. Almost all design guidance drew heavily on directives from the American Association of State Highway and Transportation Officials or the National Association of City Transportation Officials. Of the 62 bicycle facility design elements identified in bicycle guidance documents, fewer than half have been studied in any way for efficacy, safety or traffic impact. Video Analysis. On roadways with sharrows, signs for shared lanes or no bicycle facilities, drivers were more likely to encroach on adjacent lanes than were drivers on road-ways with buffered or striped bicycle lanes. Queuing, or lining up behind bicyclists, showed the greatest potential to impact traffic flows. The highest rates of lining up occurred on roads without bicycle facilities and roads with shared facilities but no marked lanes. Implications. Sharrows may alert drivers to the presence of bicyclists, but in the impact they make on traffic, sharrows differ little from no bicycle facilities. Roadways with signs indicating shared lanes also show little difference in driver behavior from roadways with no facilities. Therefore, where space allows, buffered or striped bicycle lanes should be used instead of sharrows or signs to increase the predictability of driver behavior and reduce queuing impacts on traffic. This study provides enough data to support the recommendation of dedicated, striped or buffered bicycle facilities where demand or interest exists. However, the detailed video analysis conducted for this project provides only part of a three-dimensional study of the efficacy and value of various bicycle facility designs. Further study will be needed to quantify facility and vehicle-bicycle interaction in terms of other traffic impacts like speed and traffic flow coefficients, and to quantify crash rates and other safety impacts. Research is also needed to investigate bicycle facility demand and bicycle use on road-ways that do not currently have bicycle facilities. This post pertains to the LRRB-produced Report 2017-23, “Traffic Impacts of Bicycle Facilities,” published June 2017. The bicycling industry in Minnesota—including manufacturing, wholesaling, retail sales, and non-profits and advocacy groups—produced an estimated total of $780 million of economic activity in 2014. This includes 5,519 jobs and $209 million in annual labor income (wages, salaries, and benefits) paid to Minnesota workers. These findings are an important component of a multifaceted report from U of M researchers. Their research, funded by MnDOT, provides a comprehensive understanding of the economic impact and health effects of bicycling in Minnesota. Xinyi Qian, an Assistant Extension Professor in the U’s Tourism Center, was the project’s principal investigator. For the bicycling industry portion of the work, the co-investigators were Neil Linscheid, Extension Educator, and Brigid Tuck, senior economic impact analyst, both with U of M Extension. “Information about the bicycling industry is scattered, so we filled the information gaps by creating a list of bicycle-related businesses in Minnesota, interviewing bicycle-related business leaders, surveying bicycle-related businesses, and gathering additional information from relevant sources,” Linscheid says. “Numerous industries and a diverse supply chain are involved.” The research team then used this information to enhance an economic model that shows the economic contribution of the bicycling industry in Minnesota. “Minnesota has a strong bicycle-related manufacturing industry that drives the bicycle-related economy,” Tuck says. “Specialty bicycle retail stores, especially independent ones, are a critical component of the bicycle retail industry in Minnesota.” Additionally, she says, when asked about local suppliers, bicycling businesses often provided names of other Minnesota companies, many of which are also bicycle-related businesses. Researchers also looked at the economic impact of bicycling events—races, non-race rides, fundraising events, mountain bicycling events, high school races, and bicycle tours. Qian led this portion of the study, working with Tuck. Through surveys and analysis, they found that an average bicycle event visitor in 2015 spent a total of $121 per day. This spending translates into an estimated total of $14 million of annual economic activity, which includes $5 million in annual labor income and 150 jobs. Event participants also brought additional people with them— more than 19,000 visitors who were travel companions but did not ride in any event. The findings can help bring together event organizers and officials of various organizations—economic development, transportation, public health, and tourism—to promote the event facilities, the host communities, and bicycle tourism as a whole. Qian notes that the analysis focused on event visitors and was not a broad measure of bicycle tourism. A previous post discussed the health impacts component of the study; in April, we’ll report on the magnitude of biking in the state. According to the results of a new study, bicycle commuting in the Twin Cities metropolitan area reduces chronic illness and preventable deaths, saving millions of dollars annually in medical costs. The findings are one component of a multifaceted project funded by MnDOT. In the final report, researchers in several U of M departments provide a comprehensive understanding of the economic impact and health effects of bicycling in Minnesota. Xinyi Qian, an Assistant Extension Professor in the U’s Tourism Center, was the project’s principal investigator. Dr. Mark Pereira of the School of Public Health, one of the co-investigators, led the health component of the project. Pereira’s team began by measuring the amount of bicycle commuting among Twin Cities adults using data from the 2014 Minnesota State Survey. (The counties included were Anoka, Carver, Dakota, Hennepin, Ramsey, Scott, and Washington.) The team found that 13.4 percent of working-age metro-area residents (244,000 adults) bicycle to work at least occasionally, and the average bicycle commuter rides 366 miles per year. The researchers next estimated the number of deaths prevented from that amount of bicycling using the Health Economic Assessment Tool developed by the World Health Organization (WHO). Their analysis found that bicycle commuting in the metro area prevents 12 to 61 deaths per year, saving $100 million to $500 million annually. “At current levels, roughly 1 death per year is prevented for every 10,000 cyclists,” he says. The WHO tool estimates savings from prevented deaths but not from prevented disease. To estimate the effect of bicycling commuting on illness, researchers conducted an online survey of Twin Cities cyclists; participants also included three commuter groups and a bicycle parts manufacturer. Promote active transportation through policies and intervention programs, e.g., employer incentives. Develop consistent safety education and encouragement messages statewide to increase bicycle commuting. Continue to encourage and implement safe bicycling to school and access to bicycles for youth across the state. This blog post by University of Minnesota Professor Greg Lindsey was originally posted on the CTS Conversations blog. April 9 is national Bike to Work Day, a day to celebrate those who choose bicycling as their principal mode of transportation for commuting, and a time to encourage more people to consider this healthy, efficient transportation option. Minnesota has much to celebrate in terms of bicycle commuting. Bike-Walk Twin Cities and Transit for Livable Communities are wrapping up the National Non-Motorized Pilot Program, a federally funded program to demonstrate the potential to increase biking and walking through focused investment in infrastructure and other interventions. Bicycle commuting rates in Minneapolis have climbed to 4.5%, and Minneapolis now ranks 20th in the nation in bicycle commute share. This is a noteworthy achievement, especially considering our notorious winter weather. These achievements, along with others such as the success of Nice Ride, our pioneering bike share program, have contributed to Minneapolis being named America’s most bike-friendly city by Bicycling Magazine. Celebration of these achievements – which represent hard work by hundreds of individuals and thousands of commuters – certainly is warranted. But we only need look across municipal boundaries to know we had better put more energy into encouraging bicycling than into celebration. Bicycle commute rates in St. Paul remain below 2% less than half the Minneapolis rate, and rates in most suburban, exurban, and rural communities remain even lower. And the story remains essentially the same for all types of bicycle trips. Jessi Schoner, a doctoral candidate in the Department of Civil Engineering, is analyzing non-motorized mode shares for all trips recorded the Metropolitan Council’s recent Travel Behavior Inventory. Her analyses show that bicycling remains an urban phenomenon, with the share of all trips taken by bicycling highest in Minneapolis, followed by St. Paul, and then suburban and outlying communities. Why is this so? Better infrastructure no doubt is part of the reason, but there likely are other reasons, including housing patterns, access to employment, socio-demographic factors, and culture. Additional research is needed. But this leads to additional reasons to be optimistic this Bike to Work Day: the commitments made by the Minnesota Department of Transportation (MnDOT) to foster multi-modal transportation systems and the agency’s investments in research to increase understanding of bicycle traffic patterns. In 2013, as part of the Minnesota Bicycle and Pedestrian Counting Initiative, MnDOT funded the installation of the state’s first two automated, continuous in-street bicycle counters. These counters, which monitor bicycle traffic around the clock, 365 days per year, will provide new insights into the bicycle traffic volumes and their daily and seasonal patterns. While bicycle traffic monitoring in Minnesota is only in its infancy, it represents progress towards establishing the evidence base we need to determine how to make bicycling safer and to invest in bicycle infrastructure. And so celebrate this Bike to Work Day and thank your fellow Minnesotans for all they have accomplished. But also take time to reflect on the work that needs to be done to improve opportunities for cycling throughout the state, for we have miles to go. Greg Lindsey is a professor at the University of Minnesota Humphrey School of Public Affairs. His areas of specialty include environmental planning, policy, and management. His current research involves studies of the relationship between the built environment and physical activity, specifically factors that affect the use of pedestrian and cycling infrastructure. Lindsey presented some of his bicycle and pedestrian data collection research at the 2014 Minnesota Transportation Conference held March 4-6. In a continuing effort to better understand nonmotorized traffic patterns in Minnesota, researchers from the Humphrey School of Public Affairs have partnered with the Minnesota Department of Transportation (MnDOT) to develop guidelines and analyze information collected in bicycle and pedestrian traffic counts throughout the state. The research team, led by Professor Greg Lindsey, aims to develop consistent methods for monitoring and assessing bicycle and pedestrian traffic that can be used in both permanent, automated traffic counts and short-term manual counts. The goal is to provide evidence for decision making that Minnesota cities have historically lacked, Lindsey says. “We’ll have practical, useful information about bike and pedestrian traffic that can help local jurisdictions as they plan and invest in infrastructure,” he says. As part of the 18-month project, the research team created a set of tools and methods for short-duration manual counts of nonmotorized traffic, held training workshops, and organized a statewide counting effort involving 43 Minnesota municipalities last fall. The overall response was positive, Lindsey says, and some communities are already using their collected data to submit grant proposals for projects related to nonmotorized traffic. In addition, Lindsey and his team have examined traffic information from six permanent counters on Minneapolis trails. The continuous counts collected at these locations help the researchers understand traffic patterns and the factors that affect them, Lindsey says. For example, the team found that bike and pedestrian traffic vary by trail type, time of day, day of week, and season. “Once we know the patterns at permanent sites, we can develop factors that help us expand short-term counts from other locations with similar conditions,” Lindsey says. The factors could be used to estimate anything from total daily traffic to annual traffic, as long as the short-term count location is similar to an existing model. Based on the overall results of the study, the research team developed recommendations for MnDOT. These include continuing to coordinate statewide short-term field counts, demonstrating the feasibility of automated counting technologies, and beginning to integrate nonmotorized and vehicular traffic databases. Based on these recommendations, MnDOT is moving forward with a new project that will collect more short- and long-duration counts throughout Minnesota, says Lisa Austin, ABC Ramps coordinator at MnDOT. The next phase of work aims to collect counts for pedestrians on sidewalks, bicyclists on shoulders and in bike lanes, and pedestrians and bicyclists on multiuse trails. MnDOT plans to install more permanent, automated counters in suburban and midsize cities and to conduct additional manual counts in smaller cities around the state, Austin says.